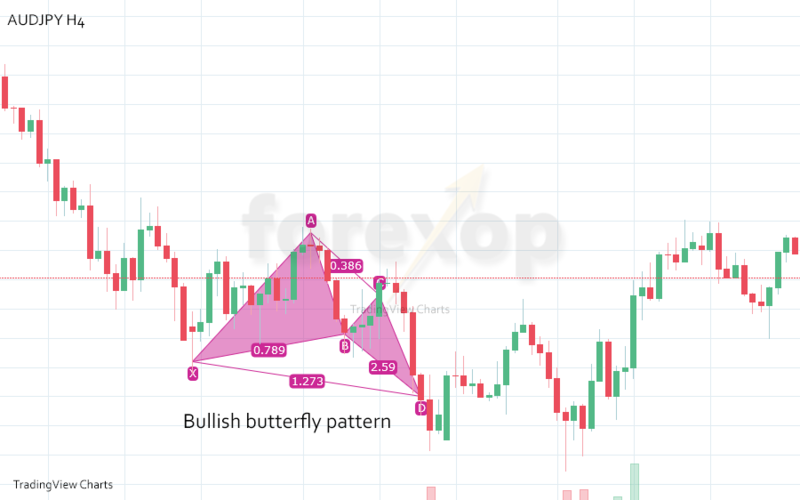 The butterfly is a harmonic chart pattern which you can use to trade possible trend reversals. Relatively new, it was first publicized in the 1990s by Bryce Gilmore and then later by Scott Carney. 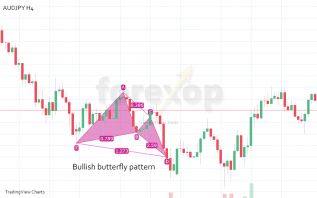 In this article, we’ll first look at how to recognize the butterfly, how to confirm a good trade setup, and how to calculate stops and profit targets that will align with the possible retracement areas. Butterflies are quite easy to recognize on real charts once you know the rules. It is a simple five point harmonic pattern, called an XABCD pattern. The structure has a small central point and two lines going in and coming out. These look a little bit like a butterfly’s wings. An easy way to remember them is that the bullish pattern has low wingtips and the bearish high wingtips. The butterfly is distinguished from other harmonic structures by the ratios between each section. According to Carney, to be a valid signal on which to trade the butterfly needs to have a proper alignment of Fibonacci ratios. From the first leg, XA, check the retracement ratios of the remaining distances between points to classify the pattern. The first ratio AB should retrace 78.6% of XA. The reversal at C lies within a range. BC should retrace anywhere from 38% to 88% of AB. The leg CD can range anywhere from 161% to 224% of BC. If AB makes a shallower retracement, the structure could classify as a crab. Since C is “elastic”, it’s easier to first confirm if X, B and D are roughly in alignment. The last point, D is at what’s called the potential reversal zone (PRZ). In Elliott wave analysis the leg CD is expected to be the final impulse wave for the trend. For a sturdier confirmation check if the last point of the bullish butterfly breaks a new recent low. Do the reverse for a bearish pattern, and confirm if the last point does indeed break a new recent high. When a trend reverses, usually volatility increases around that event. For this reason it is usual for the market to break below/above the potential reversal zone, rather than reversing exactly at that level. An ideal structure has AD=127%XA. But this is usually allowed to vary in the PRZ up to about 162%. If you use charting software like TradingView, this has a harmonics module and it will calculate all of the ratios for you. Even so it is worthwhile to understand from first principles how the calculations are done. The table below lists the points and ratios in a “made-up” bullish butterfly example. In this made-up pattern, the price starts at 100 and the first move is to 150. If we let the ratios be within the allowable ranges, this means that B should retrace back down to 110.7. Then at C there’s a reverse move back up to 145.5. Finally, on the last leg the price moves below the start point X, to 86.3 to point D.
This is confirmed in the table, so the pattern is indeed a valid butterfly. Remember that point D lies in what harmonic traders call the potential reversal zone (PRZ). Its exact position will vary somewhat depending on the trend and price action. 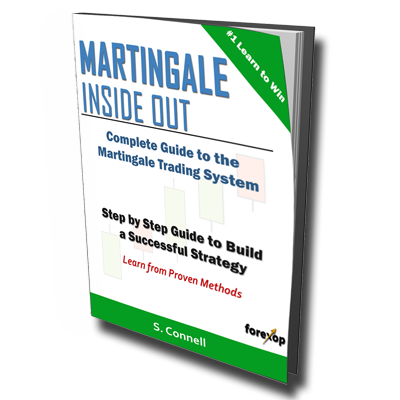 Align the stop losses and profit targets with the Fibonacci retracement levels. 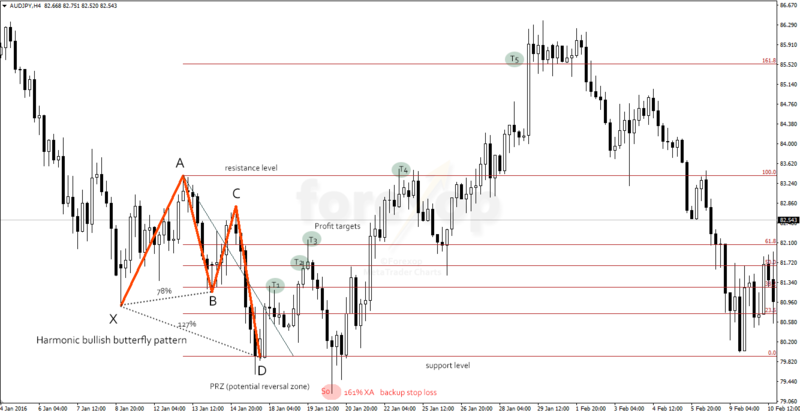 The profit targets are set at levels 38%, 50% and 61% and 100% retracements from the high/low points in the pattern. Nearly all chart software, including Metatrader has a built in Fibonacci retracement tool. With this it is easy to work out the stop and profit lines by lining up the grid with the points in the pattern. The tool will extend out to give the correct levels which can then be read off the chart. See Figure 3. A good strategy is to set the first take profit at the first zone. If that profit target is reached the stop can be trailed to the next zone above and the take profit lifted, assuming the first take profit order hasn’t executed yet. Rather than entering all in one, pyramid the position grid fashion, increasing exposure if the price moves in the anticipated direction of the new trend. As above the stop and take profits for each of the positions then ratchet upwards (or downwards for shorts). For a bullish trade setup, place your backup stops just below the PRZ. Then if the price falls below around 161% of XA, then that triggers a stop loss order for the full position. If this happens the setup has failed. Exit here because the original trend is probably rebuilding strength after a passing consolidation. Charting software will save you from having to do the more tedious measurements yourself. But you will still have to identify the patterns in the first place and confirm a valid trade setup. 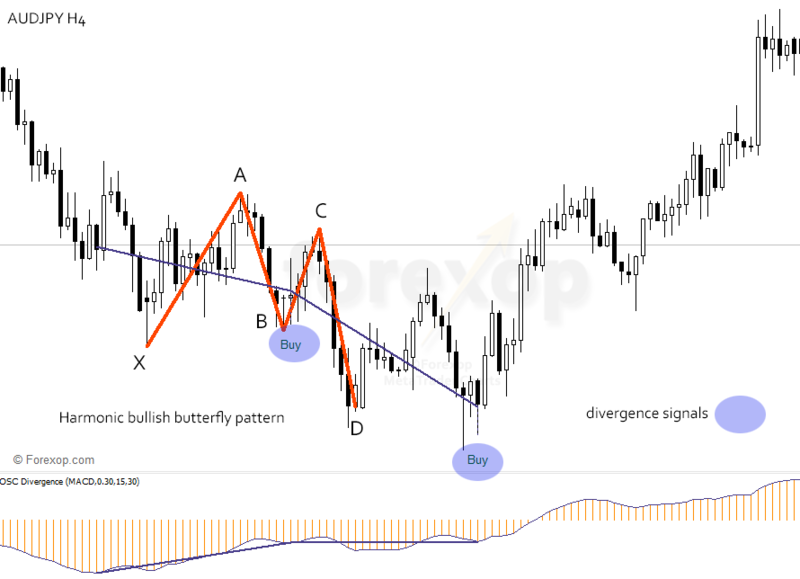 The example in Figure 2 is a bullish butterfly developing in a down trending AUDJPY. Figure 3 displays the same chart section in MetaTrader. To calculate the profit targets, set the Fibonacci retracement tool between point A and D, the high and the low. The green circles in Figure 3 mark out the corresponding lines. In hindsight we can see in Figure 3 that the actual reversals do align very well with the anticipated profit targets. After profit target 3 (at 82.1), the price does fall back to test the support level at point D. After breaching the support momentarily, the market rallies back up to reach the 4th and 5th profit targets. If we used a trailing stop method here for each split entry, the profits lock-in after each target is met. To confirm a harmonic reversal we always look at other indications such as divergence. The chart above confirms that a divergence of MACD and price action is also signaling a strong buy at point B and after point D. The second buy lies in the potential reversal zone. The divergence gives a good deal of additional confidence in a potential bullish reversal at this time.